If there ever was a town that makes you feel like you have stepped out of a fairy tale, Colmar would be that town. Literally, Colmar is straight out of a fairytale book. Located in the heart of Colmar is the enchanting “old town” – with its beautifully preserved 9th Century architecture, colourful buildings and little romantic canals, it truly gives you a glimpse of how life may have looked over 1000 years ago. Colmar is not only known for it’s fairytale charm but also for it’s local gourmet produce and beautiful fine wine. I was absolutely enamored by this little part of town and it’s a must see if you are in France or in our case we were just over the border in Switzerland and took a day trip to this magical town. Colmar is such a wonderful place to wander about the lane ways, admire the buildings, do a little shopping and then just sit and watch the world go by with a glass of wine in hand, in one of the many restaurants by the canals. 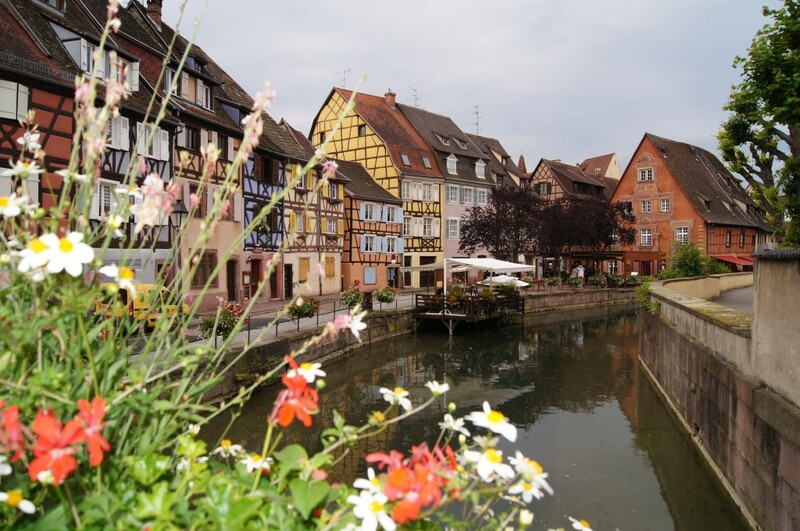 Colmar is known for its wine and is the Alsace wine region capital. The Alsace wine region stretches some 170 km from north to south and winds its way through picturesque towns. Colmar is along this trail and has a well deserved reputation for its fine gastronomical affairs and wines to match, so when you are visiting Colmar you must sample the local wine, it would be a crime not to! Arrange to do some wine tasting or just drop into the local wine merchant, who will offer their regional wines for sampling. We did just that and took home quite a few of the good local wines on offer. Little canals run right through the heart of Colmar, which was formally the fishmongers, butchers and tannery quarters and is now known as Little Venice. There is an opportunity to take a gondola ride along the canals for a close up view of the beautiful and colourful buildings that surround it. Other than walking, another way to take in the sites of Colmar is a ride aboard the tourist train. A fairly inexpensive ride that will have you going past all the significant sites and areas with a running commentary on each. My friends and I took the train and found it quite good, simply plug in your headphones select your language and sit back and enjoy the ride! That’s me on the tourist train checking over my photos, and in the background is the most photographed area of Colmar. Simply beautiful with bursts of brightly coloured flowers adorning the canal. The Boîte à mouches is the smallest house in Colmar, measuring a tiny 25 square metres. The orange building sitting on the yellow building is the actual house! The building with over 100 head and mask sculptures, is aptly known as the House of heads! Take a peak through the arch and you will happen upon a wonderful private courtyard. Here is the beautiful scene on the other side of the archway. Tables all set out ready for the lunchtime diners looking for a bite to eat and a glass of wine. Colmar is known for it’s traditional hospitality and gourmet offerings, having been awarded many stars for both it’s restaurants and hotels. The famous French pastry chef Pierre Hermes started his career in Colmar. If you haven’t tried Pierre Hermes macarons then you are truly missing out! So by this time, after wandering about town for a few hours we were absolutely famished. We found a restaurant by the little canal, with a relaxed, casual setting and sampled the local wine and food. So after lunch, we came across a wonderful indoor farmers market selling gourmet cheeses, fresh flowers, fruit and vegetables, a fish monger, meats and pretty much anything that is made locally. I have to admit cheese is my weakness …. and yes that slice is for me! Well not just for me, later that night we made fondue to go with the wines we bought. A perfect ending to our day in Colmar.